What colour shoes should you be wearing with your suit? – The UK's leading man's subscription box. My mother always used to tell me how you can tell a lot about a man by his shoes. This important piece of advice was usually yelled at me as I made my way out of the door on my way to school, after spotting my scuffed greyish/black school shoes on my feet. At the time I never really took any notice. After all, I was 15 and already full swing into my rebellious years. My tie was short, my shirt untucked and my shoes were pretty much falling apart but I didn’t care. Fast forward a couple of decades and a considerable style upgrade, I fully understand and appreciate what she meant. With so many useless sayings out there this is one that I take heed to. It’s the details in a man’s outfit which give away the true character hidden underneath the suit and the quality and state of a man’s shoes is one of the biggest tell tell signs. The way a man looks after his shoes shows how much he cares for his possessions and some would say, the things he loves. To me, a man with scuffed shoes denotes a chap of chaotic domestic habits whereas a pair of polished brogues suggests a man both practical and professional who is organised and takes pride in every aspect of his life. There is however much more to a pair of shoes than simply keeping them clean. What colour shoes to wear with what colour suit is a question I am often asked on a regular basis along with “who are you and why are you in my kitchen?”. 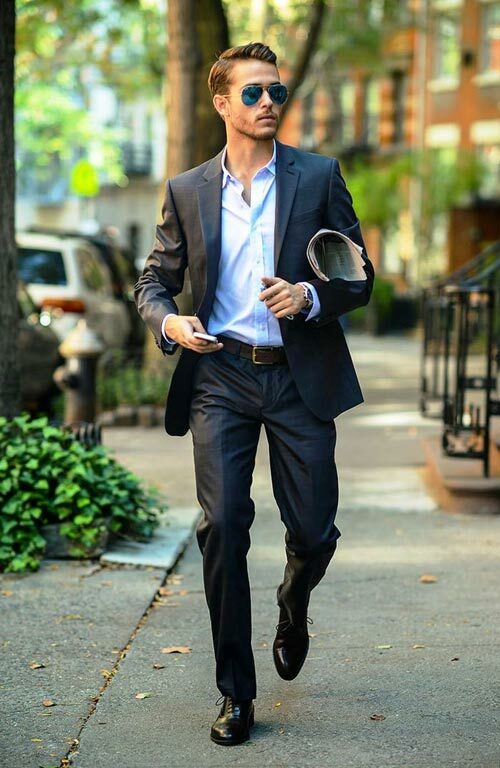 And while a black suit paired with black shoes is an obvious safe bet we’d like to think that most guys like to be a little more colourful and adventurous with their formal attire (unless you’re attending a funeral in which case black is just fine). So back to that common query. If you are wearing a charcoal, navy, grey, brown or even a red suit – what colour shoes should you wear? Below I have put together this easy to follow guide that should make the whole pairing process much easier for you. Every man should own a pair of classic black shoes and of course, the obvious combination to opt for is black shoes/black suit. This is however somewhat obvious so what other options do you have? 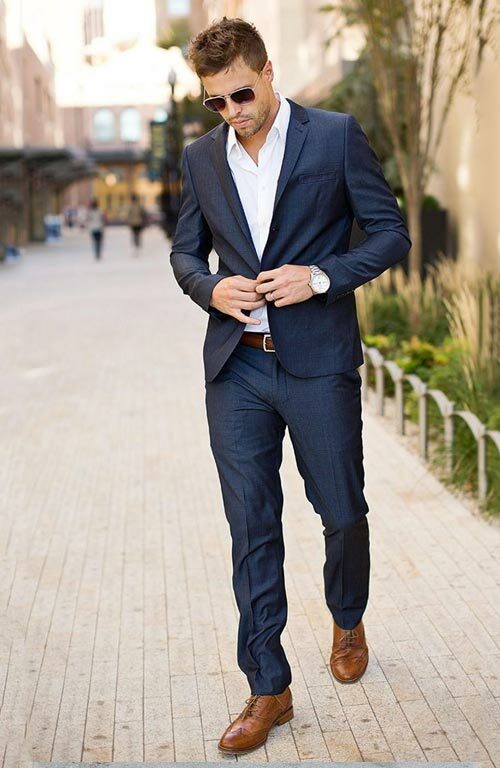 Black shoes work extremely well with grey suits and are traditionally preferred over brown when wearing a navy suit in a more professional setting. A neutral anchor for almost any coloured suit, black shoes are often the safe option if you are not sure. Personally, and this is just my opinion, I would avoid wearing smart black shoes with blue or navy jeans. I find black shoes overwhelmingly formal in nature and the contrast when worn with a more casual outfit, just doesn’t match up. In March Me My Suit & Tie released the Midas Subscription Style Box. A Gold Tie which worked beautifully with a black suit and a dark grey suit. With both options, I wore black shoes. I wanted to create a more classic look and adding more colours may have overcomplicated the finish. Brown shoes are exceptionally versatile. Navy, charcoal gray, light gray, tan and ivory are all enhanced beautifully by a pair of brown shoes. A navy or a vibrant blue suit is actually one of the best brown shoe combinations out there. The only combination I would be wary of is when wearing a black suit. However, in recent years this black and brown combination has become much more prominent, especially amongst the Italian fashionistas. In June, Me My Suit & Tie released The Peacock Subscription Style Box. A Red and Navy striped tie was the feature piece and I wore it with a grey suit with a faint red check and also a dark red blazer with a blue waistcoat and trousers. With both outfits, I wore a pair of dark brown shoes. The warmth of the tie and suit colours just demanded a deeper colour. 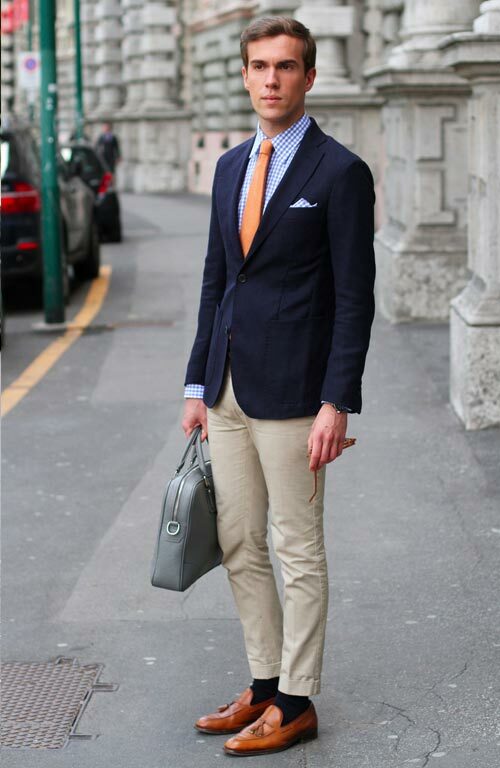 Tan leather shoes work very well with navy, blue light grey and cream suits. Darker colours such as dark grey and black are not classically matched but still workable if you are looking to create a more bolder statement. A more relaxed colour than darker brown shoes, they are also ideal if you still want to keep a touch of sophistication at more casual occasions. Whereas black shoes should be avoided with jeans, the combination of a pair of tanned shoes and blue jeans is a match made in heaven. In December, Me My Suit & Tie released The Rush Subscription Style Box. A metallic orange/gold tie meant I had to ensure the suit I wore was one of my more simpler options. A dark blue suit and a tanned overcoat was a perfect choice. Matching my tanned shoes to overcoat was a no-brainer and helped unify the entire look. Cream or very pale coloured shoes can often be tricky to pull off. To avoid any style mishaps, it is best to avoid wearing them with darker colours. Although sometimes effective, the contrast between the black or navy trousers is usually too strong and potentially ‘garish’. Instead, cream shoes should be worn with lighter more pastel colours. Royal blue, coral and in fact most colours work surprisingly well due to the neutrality of the colour. Just make sure to keep them clean! Burgundy or Oxblood shoes aren’t everyone’s first choice of shoe colour but then again they are much more versatile than most gentlemen realise. Compatible with all shades of grey, navy and blue they are even perhaps a little bit more suitable when worn with black. I find them not dissimilar to brown/tan shoes as they work with pretty much every colour you could think of. Perfect for making a simple statement with your look. 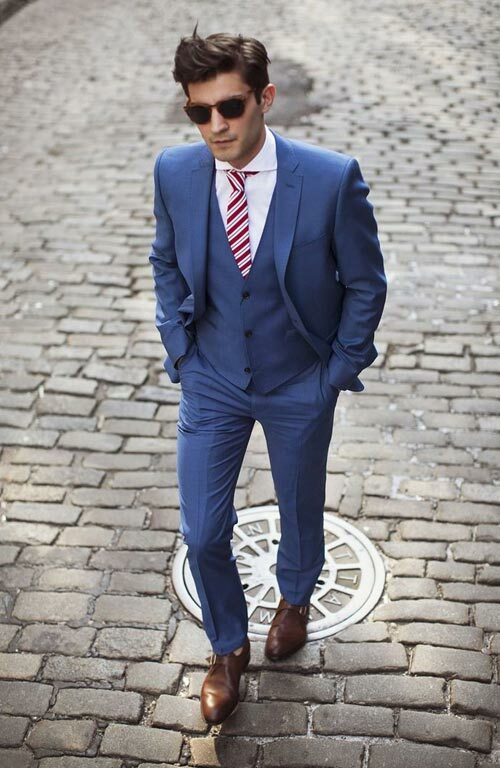 1- Make sure there is an obvious contrast between the colour of your suit and the colour of your shoes. 2- The colour of your shoes should always be darker than the colour of your suit. Alternatively, if you want to match a pair of shoes to your suit then this simple guide should help. 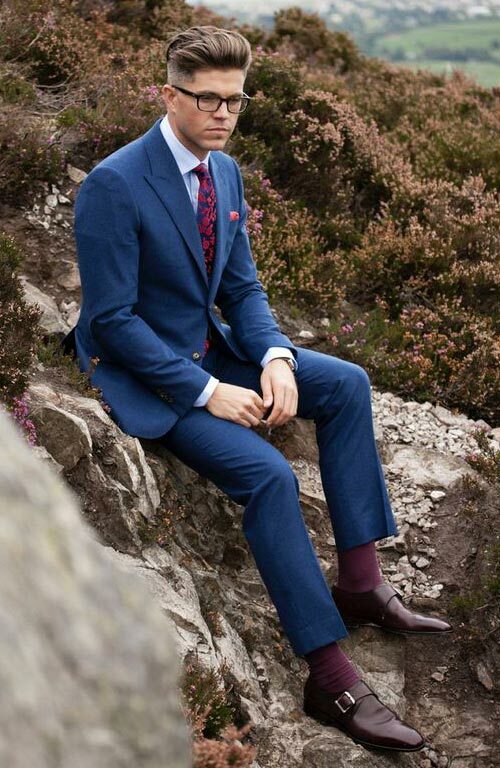 The Navy Blue Suit is possibly the easiest colour to pair as nearly every shoe colour can work. In fact the colour of shoe should be influenced more by what occasion the Navy suit wearer is attending. Formal business situations historically would have called for black shoes to be worn. However as work attire has relaxed over the last few years, brown shoes are now also widely accepted. Red or Burgundy shoes could be worn at more casual events, helping to express a more playful look. I would just be wary of wearing blue shoes with a navy suit. It may sound like an obvious choice but it may be too close to create an obvious contrast and could result in looking like you’ve tried to create a unified outfit but ended up screwing it up a little. Obvious contrasts are always a better look. Grey suits are less formal than navy and can also be worn with most colours. For a smarter or more formal affair where a white shirt and smart tie is being worn, black shoes are always the best option. If you are aiming for a more relaxed look with perhaps a patterned shirt, brown or burgundy shoes can be a great option to complete your outfit. When wearing a brown suit the key is to make sure the colour of your shoes is darker than the suit itself. Most brown shoes work but make sure there is an obvious contrast between the two. Again if they are too close in colour it can look odd. Ideally, I would refrain from pairing your brown suit with black shoes. Black just doesn’t go as well as your other options. When wearing a charcoal grey suit try to keep away from brown shoes. Plain black always works best but pairing your suit with a pair of dark burgundy shoes will result in a look that is more elegant and relaxed. Black suits are not so flexible. It is for this reason that we tend to suggest a charcoal grey suit when picking your first suit. If you are wearing a black suit, black shoes are best. Any other colour is too casual to pair with black. So there it is but remember this is simply a guide, a bit of friendly advice if you like. Hope it’s helpful and please be sure to get in contact with any other queries you may have.